This being a race in Oakland, there were some hiccups. It’s Oakland. As the race collectively headed to the swim start, we realized there were no buoys. The race director realized there were no buoys. Either the majority of the buoys were stolen or swept out to the rest of the San Francisco Bay overnight! So the swim start was a bit of a cluster. We did have a strong flood current pushing us down the course, so my swim time is…ridiculously fast. 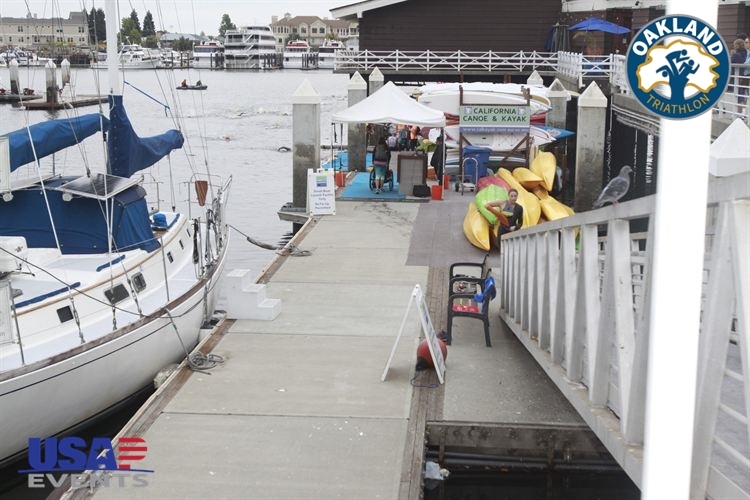 I breathe to my left in races, so I watched myself zoom down the estuary – I realized I hit the turn and almost missed it I was moving so fast! Who’s that running up the ramp? Oh it was me!! At least I had a decent enough swim under the circumstances. 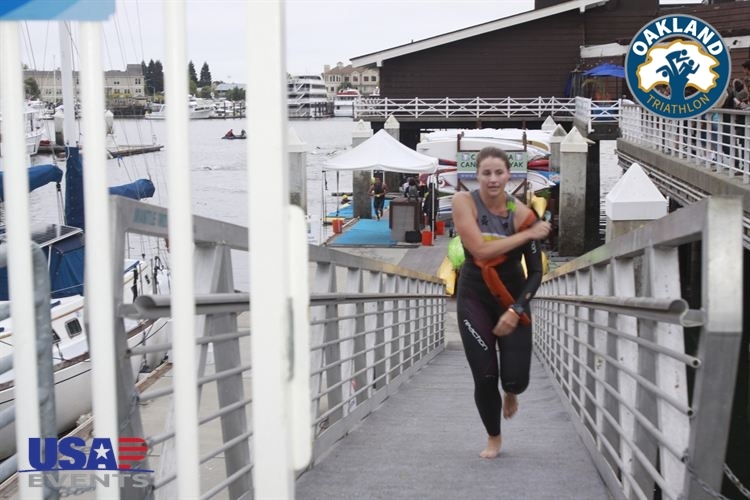 As I exited the water, I started the run to transition knowing exactly where to go – because I’ve studied the course. A guy in front of me actually was running back toward me asking where to go (bad sign #1). He was much faster than me, but close enough where I could direct him (left at the building! Right at the street! Up the stairs and left!) 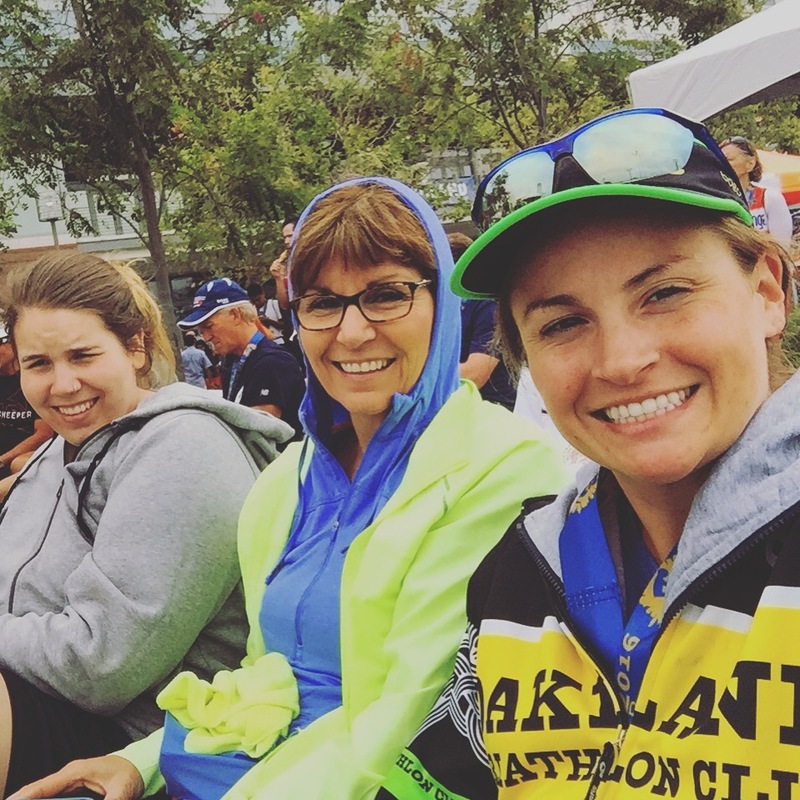 – but as we headed down the train platform toward transition, a herd of athletes were crossing straight from the swim exit to the transition area over the train tracks. Based on the time of the guy in front of me, I’d say that everyone under a 5 minute transition should have been disqualified for cutting the course… but this is a local race, not the Olympics. While it seemed like maybe there were volunteers missing on the transition run, there were certainly plenty on the bike. USAP is great at absorbing and reacting to feedback, and they made some significant improvements on the bike course this year. It was slightly different, as we no longer take Broadway through downtown. Slightly that’s disappointing, but we do get significantly better pavement out of it. Plus, the reduced turn count made the course far more comforting to someone on a brand new triathlon bike (me!)! Overall, I’d say my bike leg was fairly successful. It was a little slower than I would have liked, but I felt good and was able to really feel out racing on the P2. I even emailed Andres at Beyond Aero (my bike fitter) to tell him I almost wish I had done the Olympic course so that I could have spent more time on the bike! 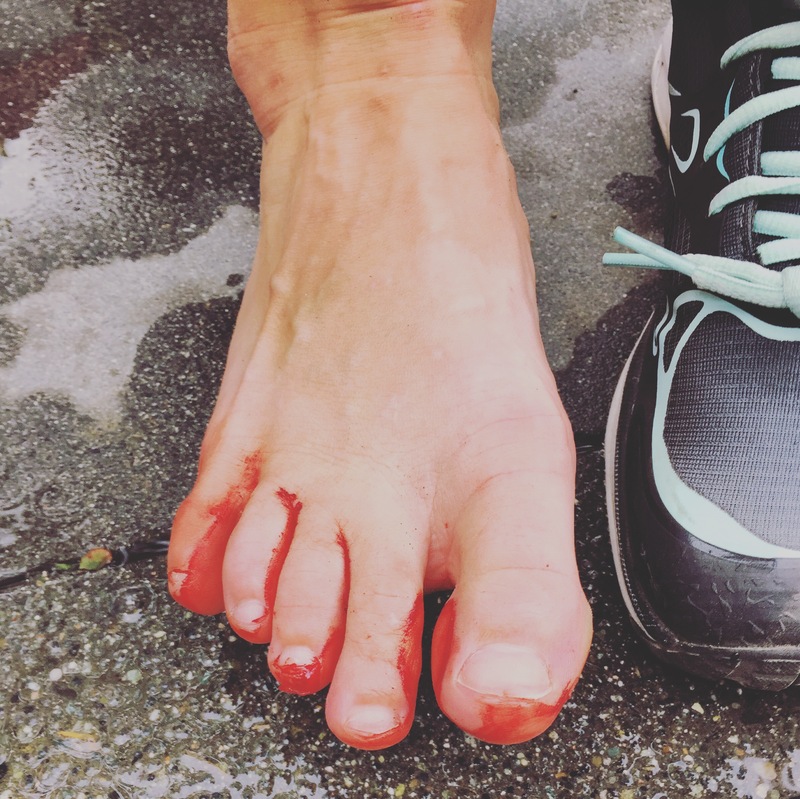 I had a moderately successful dismount – I tried to take off my middle toe with the asphalt – but didn’t crash and had a FOURTY-SEVEN-SECOND transition. Proud of that one! The run course was almost exactly the same as last year. Being Oakland, we had some new residents to…well, avoid on the run. Without delving into social commentary, we do have homeless encampments in Oakland, and the run went right by one. Not the most ‘scenic’ for out of town racers, but hopefully a good reminder for why we need social programs and the taxes associated with them. Maybe I am actually learning how to run? Haaa not yet. I didn’t cramp on the run this year! So that was good. But I was totally dragging the whole way. 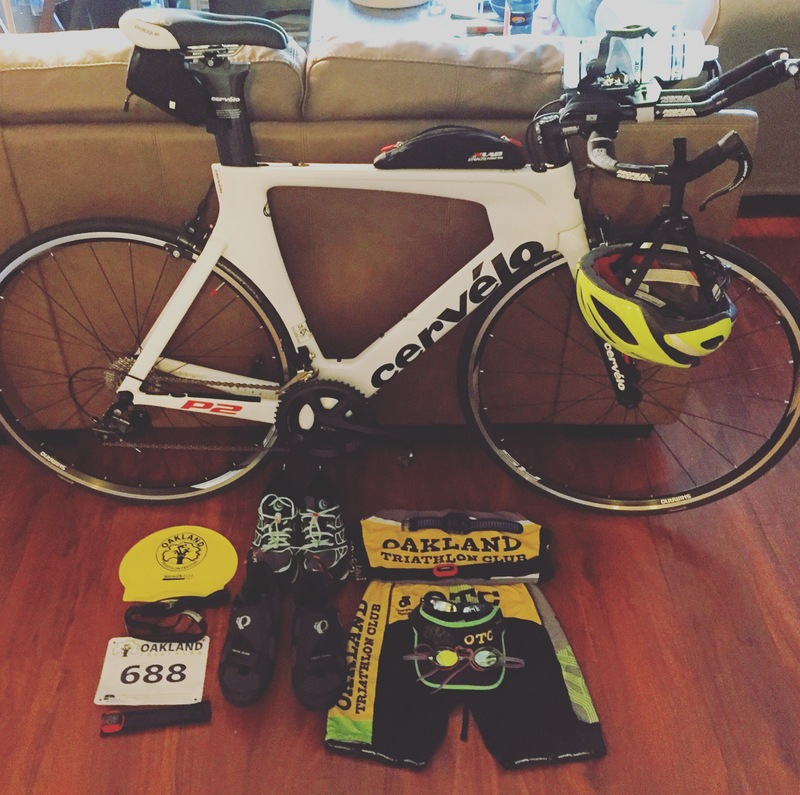 Everything hurt on my body (except my toe –didn’t feel that until after I finished). I had been the second woman to start the run, and just after the turn around one woman passed me, then shortly after a second. We were about three quarters of a mile from the finish and a third passed me, and I thought I could hold on to her feet, but she must have picked up the pace to pass. The course then takes a bunch of turns and then climbs over the railroad tracks – I couldn’t see her, but it turns out she slowed significantly. Didn’t have the mental game that day to hold on to her, but if I had, we could have brought it in for a sprint finish. End of the day, though, I managed to hold off my buddy Steve (just barely!) – he usually starts in a wave back and is much faster than me, so I’ve made it my goal to beat him across the line. I turned my head about a tenth of a mile from the finish and he was right back there shouting “you better kick it in!” So I did. And I barely beat him across the line. 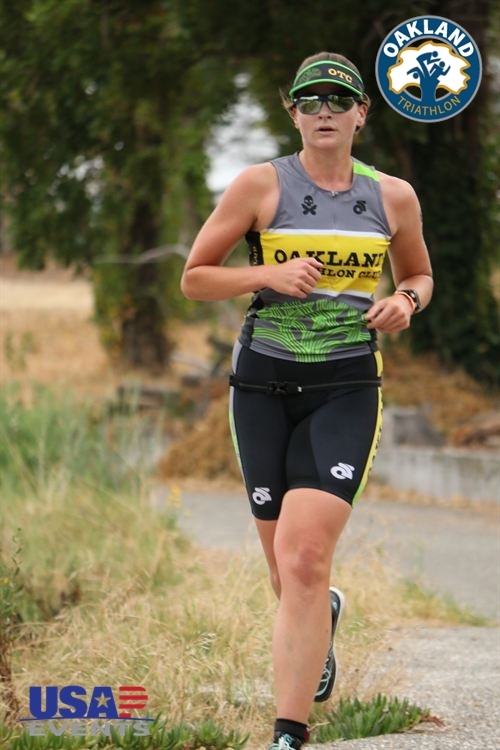 Oakland didn’t turn out exactly how I wanted – I was aiming for a top three finish and at least an Age Group podium, but turns out I was fifth overall… and also fifth in my age group. I had some awesome competition! Yay family!!! It was so nice to see these two during the race. Hopefully we’ll get them out racing some day! 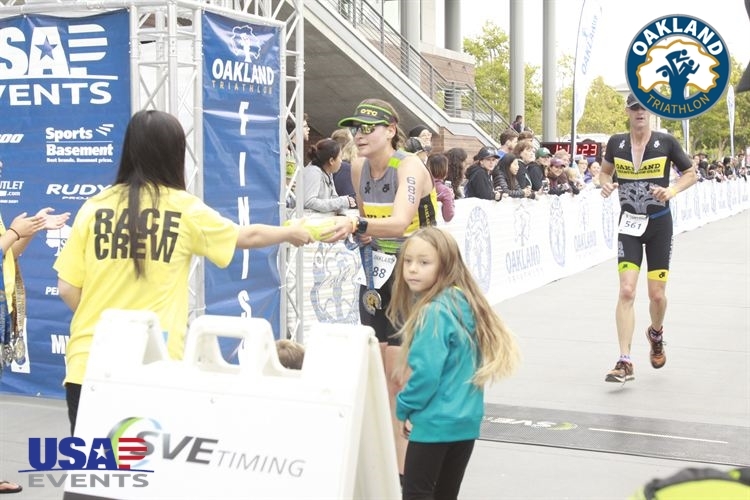 Congratulations to all my Oakland Triathlon Club teammates, especially those who were participating in their first triathlon ever! Previous Previous post: A week out? A week out.